Peter Vogel and his new baby. 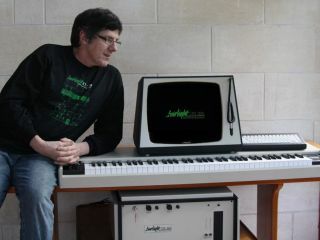 The announcement of the 30th anniversary edition of the Fairlight CMI at this year's Winter NAMM Show got a lot of music technology veterans reminiscing. However, there was also talk of the future, and what the new CMI-30A might actually offer. More details have now been forthcoming from creator Peter Vogel, who's released a preview video that shows him discussing the new machine's light pen/mouse control, page-based interface, sampling and effects pages, 3D waveform editing and sequencer. Are features likes these going to be enough to convince anyone to shell out $20,000 for the new machine? Have a look and decide for yourself. If you're looking for a more affordable Fairlight option that's available right now, check out the iOS version.